Problem: Create unified achromatic gray compositions with defined visual hierarchy and an area of emphasis, based on photographic portraits. Concepts: Value, grayscale, achromatic, emphasis, contrast, shadow, highlight, narrow value, broad value, high key, low key, open-value composition, closed-value composition, scale, visual hierarchy, movement. Technical Skills: thumbnail sketching, painting techniques, draughmanship with ruler/t-square, exacto knife and collage, digital tools: rectangle marque, move, transform, modifier keys. We will take a short walk around City Tech. If you have the ability to shoot in grayscale, please do. Designate a new section of your sketchbook and write ‘Value-Added Portraits’. Compose a minimum 2-paragraph description, with specific references to the images, indicating how the key sets the mood of the composition. Also notice and report how the forms in the composition create highlight and shadow relationships; some may be abrupt, others may have a gradation of value from light to dark. How does this contribute expressive quality (mystery, drama, success, joy, etc) of the compositions? * If you don’t have a camera, please partner with another student who does. On the handout provided, create 4 scales starting with 2 steps and ending with 9 steps ranging from black to white in even, progressive increments. Label (in good handwriting) your 9-step value scale with black, low dark, dark, high dark, mid-value, low light, high light, white. Create a new blog post called Value-Added Portraits: Phase 1. Refine your writing and add it to the post. Include the hours that you worked on this part of the project. Don’t forget to comment on at least 3 other student’s posts. 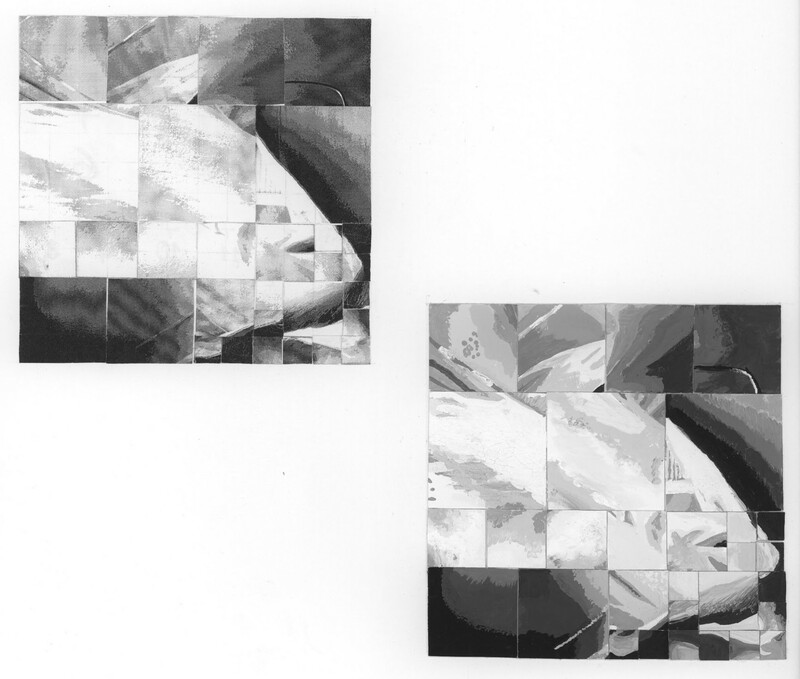 Using the printouts of the portraits taken last class, cut apart your portrait into a variety of squares or rectangles. Create a focal point wherein one area or element is emphasized through contrast in scale and value. Use Visual Hierarchy and Movement to clearly direct the viewer’s eye to the focal point. Use Value steps to support transitions from one compositional element to another. Avoid reconfiguring your compositions using recognizable facial features (eyes, nose, mouth). Examine the lines and shapes that make up your portrait and create new shapes and lines that convey a certain mood. DO NOT GLUE THEM DOWN YET! Have the Professor review your work before continuing. Take a photo of your finished and approved collages, just for future reference. Make sure each piece of your composition is properly marked on the back, indicating the TOP and numbered from left to right, top to bottom. Position each piece in your collage composition on a piece of paper. Use a small bit of tape on the back to adhere your pieces to the paper. Keep everything clean and neat. Create a new blog post called Value-Added Portraits: Phase 2. Add an image of your 2 collages. Don’t forget to caption them Broad Range or Narrow Range (high-key or low-key). Recreate your broad-range collage in paint. Using your collage pieces as a visual reference, you will be using a viewfinder and grid and painting each area in isolation (independently) from its neighbor. This is VERY important. Create a viewfinder frame, so that you only see one area of your composition at a time while you are working. Draw grid lines around the edges of your collage (NOT ON TOP) to keep track of your progress. On a piece of clean, 9×12″ bristol trace or measure the dimensions of your collage squares from the exercise above. Depending on the size of your compositions- one composition per 9×12″ bristol will be best. Using your Value Scale as a guide, recreate (in gouache paint) each area of your composition using a range of black, white, and gray values- achieving continuous tone in areas where highlight and shadow blend together. Do not worry about accurately rendering an eye, nose or ear, think only in terms of value and the boundaries of each value shape relationship. Notice how some values crossover shape boundaries into adjoining areas (open-value), while others are limited by the edges of the shape (closed-value). Remember to work on each square independently and protect your finished painting with tracing paper as you work. Gouache is very delicate and can easily pick up the dirt and oils from your hands. Mix a very small amount of water thoroughly into the paint, for each value you create. The consistency should be like whole milk or cream. Before you apply paint to paper make sure it’s completely mixed in the palette to produce a flat consistent appearance. We want flat, blocks of paint with few streaks or brush marks. Wash your brush after each value is mixed and applied. Keep two containers of water, use 1 for washing your brushes and 1 for adding water to paint. Use a paper towel or rag to get excess paint and water off the brush before mixing a new value. When you have completed your composition carefully protect all elements with a piece of clean tracing paper and cardboard. We will cut and mount the painting with the original collage together in class. Using photoshop, recreate your narrow-range paper collage composition. Download your photo (DOWNLOAD) and open in Photoshop. 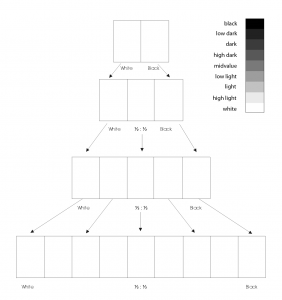 Create a new file: 6″x6″, 300 pixels per inch, grayscale. Set the Move tool (V) options to Auto Select > Layer. Use your second collage as a guide. select portions of your original photo portrait and copy and paste them into the new document to recreate the paper collage. Use the Move tool (V) and click on the pasted objects in your collage to quickly select and rearrange your “collage” pieces. This also selects them in the Layers palette and allows you to manipulate them. Use the Transform Tool (Command + T) to rotate your “collage” pieces. 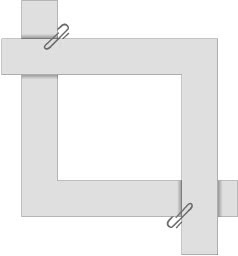 Add in the Shift Key to restrain the rotation to 90 degrees. Do not resize or stretch! Hold down the Option Key while dragging with the Move Tool to create quick copies of a selected layer/object. DO NOT USE OTHER FILTERS, COLOR, OR ANY OTHER TRANSFORMATION TECHNIQUES, besides flip, rotate, or mirror. If you are familiar with Photoshop, feel free to use more advanced techniques, as long as they keep within the guidelines of the project description. Print, cut out, and mount the final digital collage with your original paper collage on a piece of 14×17″ piece of bristol. Save another version as JPG 72dpi, as demonstrated in class for upload to the blog later. Print out (5) b/w laser prints and bring to class for a group collage! Open your original portrait image and this file in Photoshop. We will work together using the template file (and 3D glasses) to create an anaglyph image. Create a new blog post called Value-Added Portraits: Phase 3. Include a sentence or two about the work you are presenting. Bring all parts of this project to class. Take a photo of the work displayed in the classroom. Be prepared to present, discuss and analyze your finished work in terms of concept, craft, what you learned, and the design process. State the following: your name, what you are presenting (title and design problem), which parts are successful and why, which parts are unsuccessful and why. Your peers and the professor will provide feedback. You will have an opportunity to revise your work based on the feedback and improve your grade. Create a new blog post called Value-Added Portraits: Phase 4. In the post, document your thoughts about this project. Think about what you learned, what you could have done better (planning, material use, craft), and how you will apply what you learned to your next project. Consider and respond to the comments made in class during the critique. Include the photo of the work(s) as it is presented during the critique (ie: hanging on the wall).